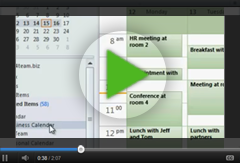 New ShareO, ShareCalendar, ShareContacts version 2.30 is available for download. ShareO, ShareCalendar, ShareContacts new major update available for downloading. New updated version of ShareO, ShareCalendar, ShareContacts available for download. Updated version of ShareOutlook, Calendar4Outlook, Contacts4Outlook is available for download. Updated version of ShareOutlook, Calendar4Outlook, Contacts4Outlook (2.10.0107) is available for download. Main updates and fixes: Updated product activation. New Welcome screen. Many other minor bugs and problems fixed. Totally new ShareOutlook version 2.0 available for download. New Update of ShareOutlook, Calendar4Outlook, Contacts4Outlook. Minor Update of ShareOutlook, Calendar4Outlook, Contacts4Outlook. Updated version 1.3.40 of ShareOutlook, Calendar4Outlook, and Contacts4Outlook is available for download. Problem with "Unread Only" in Outlook 2002 corrected. This Update applies to Microsoft Outlook 2002 users only.